Photosynthetic Active Radiation (PAR) was derived from the McCree Curve. It is a total count of light energy (in photons) between 400nm to 700nm. This represents the area of light that plants use for photosynthesis, or to grow. PAR is measured by the amount of micro moles of light per square meter per second. Although PAR is a key measurement, it only tells one part of the story. The PAR measurement has two fundamental flaws. First, the wavelengths between 325nm to 400nm and 700nm to 780nm are excluded from the PAR measurement. Second, all photons are weighted equally regardless of wavelength. 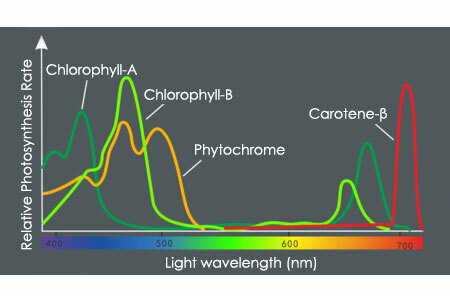 The measurement for PAR is Photosynthetic Photon Flux Density (PPFD). This is the number of photons in the 400 to 700 nm waveband incident per unit time on a unit surface. PAR, provides photosynthetic photon flux density (PPFD) in units of Einstein per m² per second. The McMree Curve clearly shows plants respond to energy outside the 400nm to 700nm PAR range. Furthermore, plants respond differently to energy within the PAR range. Light’s spectrum must be used in conjunction with the PAR to determine from what bandwidths those micromoles are being generated, and in what amounts. These two readings (PAR & Spectrum) together will give a complete picture of a light’s effectiveness; PAR showing strength, and spectrum showing that this strength is in the proper wavelength proportion for what the plant can actually utilize, and not just wasted energy. These two measurement tools produce a reading that shows not only what wavelength or color is being emitted, but also the absorption value of that particular wavelength.